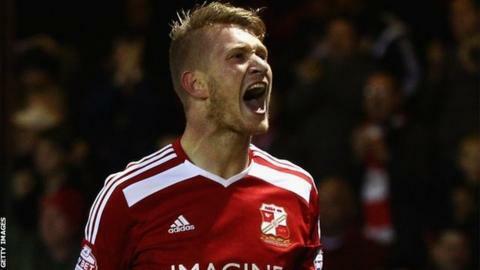 Michael Smith's 10th league goal of the season helped Swindon to a comfortable victory over Walsall. Swindon took an early lead when Smith converted Nathan Byrne's cross before Tom Bradshaw capitalised on a loose ball to level for the Saddlers. Massimo Luongo fired home at the near post to put the Robins ahead shortly after half-time. Smith then set-up Andy Williams for a third Swindon goal before the same pair combined to seal victory. Swindon, who have now won five of their last six matches in League One, remain third, a point behind leaders Bristol City, while Walsall, who had been unbeaten in their previous seven league games, drop to 15th. "It's a brilliant result. It wasn't our most scintillating of games but sometimes that happens. We scored early, probably a little bit too early. "I thought they played really well in the first half and caused us more problems than a lot of teams. "I had a few choice words at half-time because I didn't feel we were competing. "They went out second half and I thought they were exceptional. It was a great start to the second half for us." Match ends, Walsall 1, Swindon Town 4. Second Half ends, Walsall 1, Swindon Town 4. Corner, Walsall. Conceded by Raphael Rossi Branco. Corner, Walsall. Conceded by Wes Foderingham. Attempt saved. Michael Cain (Walsall) right footed shot from outside the box is saved in the bottom right corner. Substitution, Walsall. Mathieu Manset replaces Tom Bradshaw. Substitution, Swindon Town. Jake Reeves replaces Nathan Thompson. Substitution, Swindon Town. Yaser Kasim replaces Massimo Luongo. Massimo Luongo (Swindon Town) wins a free kick in the attacking half. Anthony Forde (Walsall) wins a free kick on the left wing. Ben Purkiss (Walsall) is shown the yellow card. Attempt missed. Jack Stephens (Swindon Town) right footed shot from outside the box is close, but misses to the right from a direct free kick. Goal! Walsall 1, Swindon Town 4. Andy Williams (Swindon Town) right footed shot from the centre of the box to the bottom left corner. Assisted by Michael Smith with a cross. Substitution, Swindon Town. Harry Toffolo replaces Ben Gladwin. Michael Cain (Walsall) wins a free kick on the right wing. Goal! Walsall 1, Swindon Town 3. Andy Williams (Swindon Town) right footed shot from the centre of the box to the centre of the goal. Assisted by Michael Smith. Attempt missed. Tom Bradshaw (Walsall) right footed shot from outside the box misses to the right. Corner, Swindon Town. Conceded by James Chambers. Goal! Walsall 1, Swindon Town 2. Massimo Luongo (Swindon Town) right footed shot from the centre of the box to the bottom right corner. Assisted by Nathan Byrne.